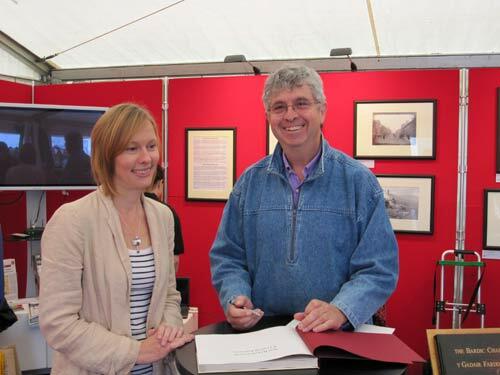 RICHARD BEBB & SIONED WILLIAMS. "A Superb new book ... as unique and .delightful as any eisteddfod chair"
"Richard Bebb and Sioned Williams have creted not just a unique book on the subject, but also a fascinating read." "This is a beautifully presented and well-illustrated book which makes a significant contribution to the material and social history of Wales. The authors have managed to balance clarity and an overview for the non-specialist, with sufficient scholarship and rigour to make a significant contribution to academic research in this field. 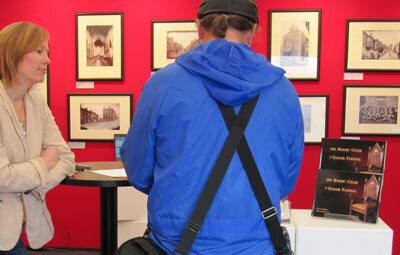 Mae Y Gadair Farddol yn cynnwys darluniau lliw gydag enghreifftiau o bob rhan o Gymru, yn ogystal â ffotograffau o grefftwyr a beirdd. Adroddir hanes y cadeiriau hynod yma yn eu cyd-destun hanesyddol a diwylliannol o'r cofnod cyntaf hyd heddiw. 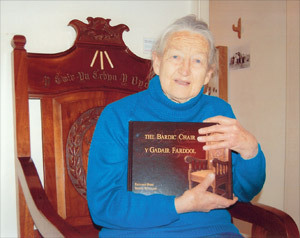 The Bardic Chair is profusely illustrated in colour and arranged chronologically with examples from all parts of Wales, and includes photographs of both craftsmen and poets. The bilingual text illuminates the historical context in which these extraordinary cultural artefacts were made and awarded. 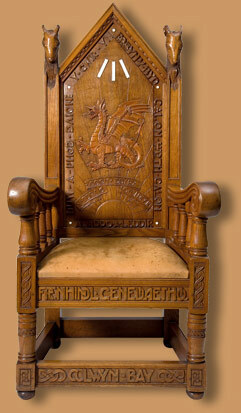 Awarded to the winning poet at an eisteddfod, bardic chairs are remarkable cultural artefacts, the origins of which are unique to Wales. 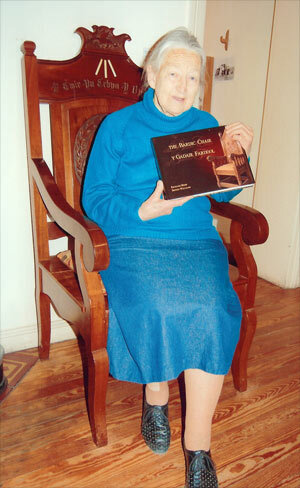 In the first book to be published on the subject, Wales’s leading furniture historians chart these chairs’ development from the medieval court, through their heyday from the 1890s to 1930s, and into the present century. They are illuminated with detailed descriptions of their craftsmanship and symbolic ornament, and supplemented by accounts of both makers and winners. 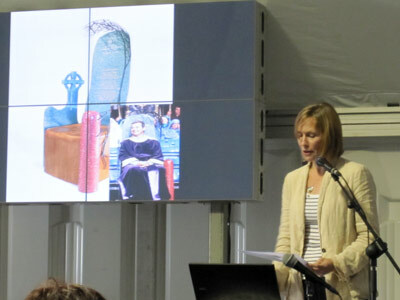 This superbly illustrated book provides a window into the history of the eisteddfod itself, at local and national levels, and will appeal to both the general reader and specialist alike. 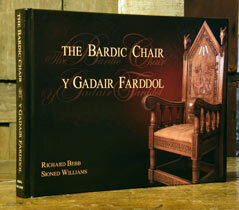 Bob Pugh of Pontcanna kindly took a copy of the book The Bardic Chair : Y Gadair Farddol to Patagonia to present to Gaiman Musuem. 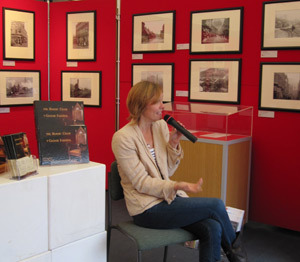 The photographs show the curator, sitting in the chair presented at Trelew in 1921, which is featured in the book. 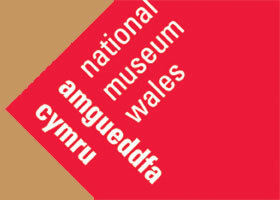 Motifs including Dragons , Lions, Rams , three feathers, and the mystic mark of the modern eisteddfod. 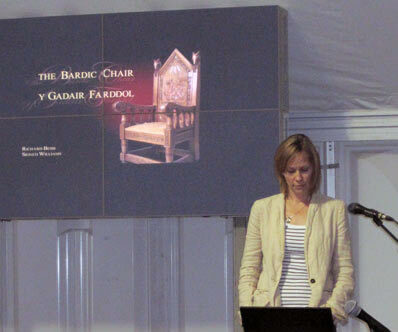 Eisteddfod Chair Book Y Gadair Farddol bardic chairs from Welsh Eisteddfod with carved chairs leather Arts and Crafts eisteddfod chair brought together in one book by Richard Bebb and Dr Sioned Williams with Druids and Druidic Ceremonies.